Made by Philadelphia Uniform Co., Inc. In the early days of the CCC, the Army provided the enrollees with WW1 surplus uniforms. Boys were issued clothing, includig stockings, shoes, denim trousers and jumpers, ties, and belts. Later, the CCC got their own dark green wool dress uniform. This Overseas Cap topped off that uniform and was very flexible for easy handling. The overseas cap has been associated with various military forces from WWI era to the present. 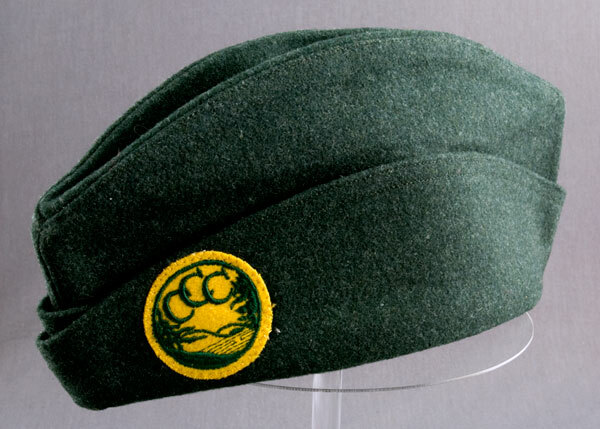 The CCC logo appeared on the hat and the shoulder.